The 2014 rerelease of Gauntlet by Arrowhead Gaming Studios, (a little known Swedish games developer and published by Warner Brothers Interactive) is a Action-Role Play/Hack and Slash game made popular by the 1985 Atari Arcade classic which is noted as being the first multi player dungeon crawling arcade games selling 7848 cabinets. The second I loaded up Gauntlet I was whisked back to my childhood, a fresh faced kid, barely able to reach the front of the arcade machine I use to play on, situated in my old Judo/Leisure Hall. Gripping a handful of coins and not leaving until I had spent them all. Waves of ghosts would attack me as I chased the gold chests or watching in awe as the big kids, far better than me got further than I ever could. 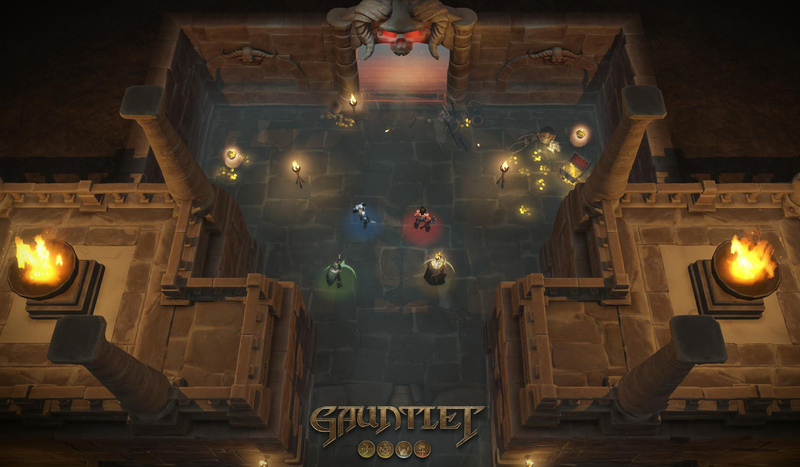 In today’s updated Gauntlet you can either crawl the dungeons armed with a keyboard and mouse or gripping a controller. I chose the former and was hooked. I instantly immersed myself into the role as Elf firing arrows at everything in site food, prop or foe. Charging through the levels battling hordes of re-spawning enemy’s, the odd higher level npc and end chapter bosses. All the while eating food to refill the health bar and then off scurrying down dead ends in search of keys, hunting out cracks in the walls, which once opened up with TNT reward you with secret areas and you are able to fill your abyssal pockets with gold and loot. Sometimes doing all this while wearing a stolen crown perched at a jaunty angle atop your head. It’s a very addictive mix of dungeon crawling, boss battles in levels and the occasional change to offer a twist or unexpected turn, in some of the levels your even chased by death incarnate who hunts you down making you rush levels abandoning potential loot and goodies to get out of his ever nearing presence. The way they have transformed the levels and the characters into a 3D world is stunning. However in it’s progression to a 3D world it really has not lost any of it’s original charm or retro appeal, but has retained it’s addictive game play and opened this game to a whole new generation. The game offers a character progression system in the form of masteries and it rewards you for killing a certain amount of enemy’s, eating food and taking damage. It also gives you a shop which allows you to buy and upgrade two artefacts that you carry into the fray. But the game really comes into it’s own when joined by up to three other friends or players, where your group strategy can be either stick together as a strong unit or run around aimlessly. The former probably being more affective. Gauntlet offers four difficulty levels ranging from easy for the beginners and up to, as the name suggests unfair. You are able to select from the old classic Warrior who looks like Arnold Schwarzenegger’s Conan the Barbarian that wields a massive two handed axe, a Sword wielding and Shielded Valkyrie and is the only female character, Merlin the Wizard who is the quintessential cloak wearing, long bearded old gent and a Hooded Elf sporting a Bow and an enthusiastic Scottish accent. All have been remastered with an all new set of moves including some game changing special moves. These are all fairly easy to pick up and to perfect although I would have to say the Wizard is quite challenging to use as a character, mainly due to switching spells from fire, ice, electricity and a defensive aura all the while swards of enemy’s are doing a good job invading your personal space. Within the menu there is a classic mode which sparked my interest only to be hit by disappoint. Sadly it just overlays the game in a 8bit grainy texture which makes the game look nothing like the classics ‘above’ view and instead makes the game in my opinion a lot worse. The gameplay and longevity of the game could span into the months/years with Steams grind fest of achievements that would have you killing tens of thousands of enemy’s but boredom might get you before that day ever comes.